Favor the Brave: 50 States of Brave Blogger Search! Wanna see all the lovely women already featured? Check out our 50 States archive, or our beautiful Pinterest board, featuring all bloggers and their Favoring Brave picks! Follow us on Pinterest and GFC to see new picks as they come out! Are you blogger in the US? Love fashion? Love life? You might be just what we're looking for. 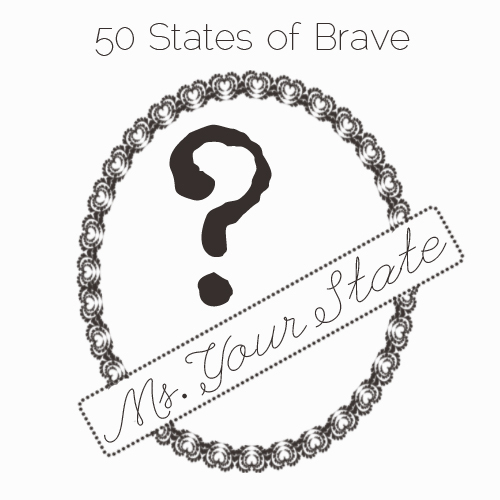 I am starting a project called "50 States of Brave" and I would love for you to be a part of it! This project will celebrate the little opportunities we have to be brave everyday and the women who make these habits a way of life. Here's what it involves! First of all, I also own an Etsy store called Favoring Brave and I am looking for some beautiful bloggers to show off my stuff for me! You can pick something out of my store, I will send it to you, and then I ask that you simply feature it in a post with a link to my store and to my blog and feature my button in the sidebar. I would also provide you with a coupon code to pass along to your readers. Secondly, I would like you to write a guest post for my blog on the bravest thing you've ever done. I do ask that it stay family friendly and free of bad language, but other than that, write about whatever you want! I will also add you to my permanent gallery of the 50 States of Brave Ladies as Ms. (Your State!) with a link to you blog and a picture of you in your jewelry (with your permission of course)! As time goes on you will receive offers to be a part of giveaways, swaps, blog parties, and exclusive Favoring Brave specials with our other brave ladies, giving you a great chance to network with them and their readers too! All in all, you'll get to be a part of a long running series of talented bloggers with great exposure, opportunities to be a part of group giveaways, and some great free jewelry! UPDATE: Alaska, Arkansas, California, Georgia, Illinois, Indiana, Kentucky, Michigan, Minnesota, New Jersey, North Carolina, Ohio, Oklahoma, Oregon, Pennsylvania, South Carolina, South Dakota, Texas, Utah, and Virginia have officially been filled. Openings for all other states may still be available. Jill, I'm so excited to see who will be featured! Could you let me know if you've gotten my e-mail?